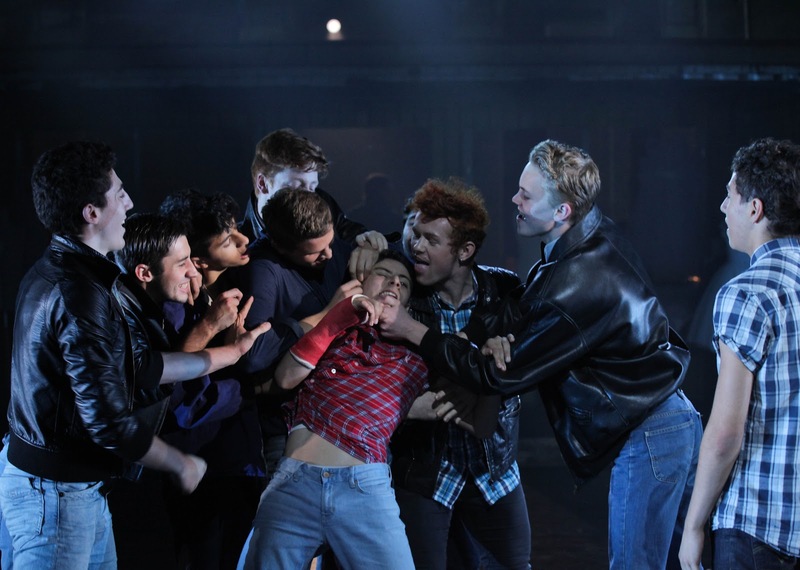 Shows don’t come much bigger than West Side Story's translation of Shakespeare’s Romeo and Juliet into the streets and alleys of New York. With a stunning interpretation, the National Youth Music Theatre’s (NYMT) stage the show in Manchester’s Victoria Warehouse, itself a glorious reclamation of what was only recently, urban deprivation and where once stood thriving docks. Takis' set design, all steel container units evokes the poverty of the story's rival street gangs, whilst the containers’ stacking amidst iron staircases and ladders suggest the staircases that cling to tenement buildings and so define Manhattan. Nikolai Foster, Drew McOnie and Tom Deering are an established triumvirate of excellence as director, choreographer and musical director respectively. These men combined are greater than the sum of their parts and the magic that they have worked with NYMT’s young company is at times jaw-dropping and frequently spine tingling. Deering (taking time out from MD’ing The Colour Purple) has coaxed the most exquisite sound from his 30 strong youth orchestra. The sound bounces off the steelwork in a way that must have Bernstein smiling approvingly from above and whilst all the musicians are first-rate, the brass section is a special delight whilst Deering’s percussionists make the second act’s Cool, sizzle! The show’s Prologue which sees the stage filled with balletic thugs whose street fight is a vision of grace and technical brilliance is swiftly followed by the Dance At The Gym, one of musical theatres most celebrated dance scenes. McOnie does not disappoint and with cleverly choreographed routines and clever use of colour, the tension of the dance, the rivalry of the gangs and the spark of love between Tony and Maria is cleverly captured. These two numbers set a standard of dance that is sustained throughout. Foster is famed for an ability to focus on depth and nuance. 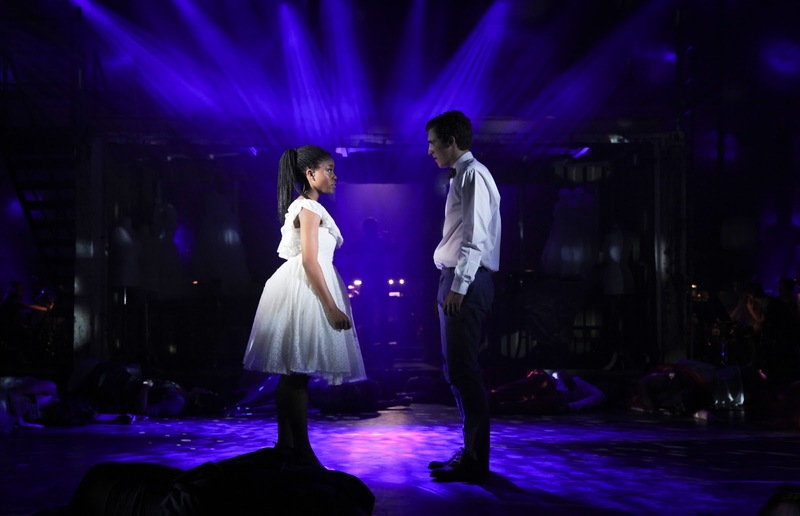 He is helped in that the perfectly voiced Amara Okereke’s Maria is a remarkable turn from an actress who is just 16, whilst Jon Tarcy’s Tony grows into a performance of depth and sensitivity. 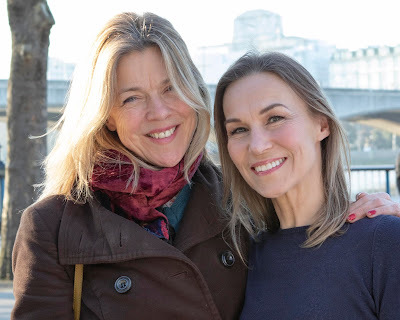 Sienna Kelly’s Anita is a definitive performance of that hot blooded Latina, whilst Rebecca Ridout’s solo performance of Somewhere brings a rarely heard anthem-like beauty to this classic number. The show has always offered some sharp moments of comedy. Gee, Officer Krupke in particular is a song that provides a welcome chuckle amidst the show’s slowly rising body count. In a recent tweet, Foster himself observed that the song must rank amongst the greatest in the canon, being so subversive, political and sardonic. A young Sondheim set himself a tough bar with this song’s lyrics and the troupe of NYMT young men who sing it in Manchester come as near as damn it to having an encore demanded of them, such is the excellence of their merciless caricatures. Ben Cracknell's use of smoke and countless clever spotlight plots gives a lighting texture to the performance space that at all times enhances the action. Credit too to the sound team who do a fine job, ensuring that voices are heard over a huge and challenging orchestral sound. 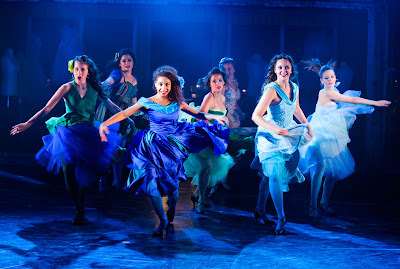 West Side Story is further proof of how the NYMT, under Jeremy Walker’s leadership and vision, maintains its reputation for excellence. The company’s tackling of major and innovative works of musical theatre under the creative supervision of some of the industry’s leading practitioners, is nothing short of inspirational for those young people fortunate enough to be its members and continues to lay down a sound foundation for this country’s musical theatre future.